If you use email, it’s likely that you’ve recently received a piece ofspam–an unsolicited, unwanted message sent to you without your permission. Spam is the Internet’s version of junk mail, telemarketing calls during dinner, crank phone calls, and leaflets pasted around town, all rolled up into a single annoying electronic email. How does the IPS SpamFilter work? The program runs in the background of your computer and removes up to 99.9% of all spam messages before they get to your email account . 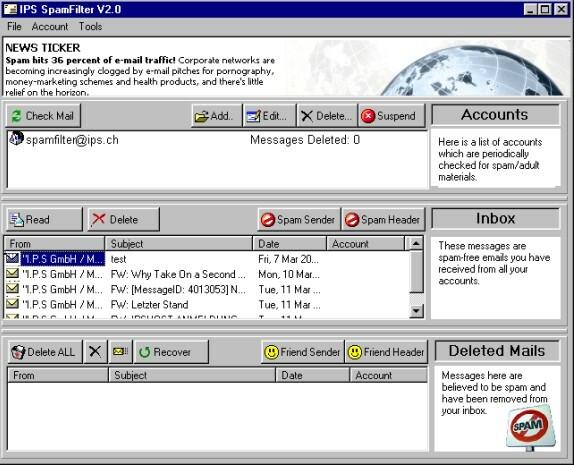 All removed spam mails are stored and can be reviewed before they get deleted.The program includes a high-tech spam analyze system database. Our team updates the database on a regular bases and you can download the newest database with a simple click on a LiveUpdate button. The IPS SpamFilter works in the background of your computer and catches automatically incoming spam mails. It works with Outlook, Eudora, Hotmail or any other common program which is based on POP, IMAP or Hotmail. All caught spam mails will be stored in the IPS SpamFilter. You may take a look at them to check if there is no important message in there. If there should be a friendly message between the spam mails, you may add the sender with only one click to your friends list and the next time you get a message it won’t be filtered. After checking the spam emails they may be permanently deleted. The main menu of the IPS SpamFilter is separated into three parts. In the upper part you will find the email accounts, which are automatically protected from spam emails. You can protected as many accounts as you wish.The middle part is showing all the mails which are in the accounts and are no spam emails. By clicking a mail you may take a look at its content.The lower part you will find a list of all spam mails which have been filtered out of the accounts. You may permanently delete a mail or reactivate a message if you wish to keep it. The program may also automatically send a removal request to the sender of the spam mail. The installation of IPS SpamFilter is very easy and you will be guided step by step. After running the program for the first time a ‘wizard’ will guide you through the configuration. After a few minutes the program is ready to filter the undesirable spam mails. To catch the spam mails we developed a special spam filter. This filter checks the sender, subject and even the content of a mail. After this check the program decides if the mail belongs to a spam or not. You even may define a friends list and a black list by yourself. The spam system is under permanently control of our team to approve the best workability and to guarantee the best spam filter results. New Spam filters and new program releases may be directly downloaded through the ‘Live Update Button’. Direct import of Outlook Address Book into the Friendly Sender List. All emails from this senders will never be identified as spam. Recognizes over 200 email virus attachments and removes them automatically. The program is available in following languages: German, English, French and Italian.